In 2016 I came across an old Buddhist Prayer box meant to keep precious prayer books safe. I soon realised that this lovely worn box full of history could be part of a new artist book inspired by a serious issue. The huge increase in the flood of migrants seen since late 2015 and the many obstacles these poor people have to overcome has inspired me to a series of prints and several artist book. 'EXODUS' has been juried through to the 8th International Artist's Book Triennial Vilnius 2018 and will in the years to come tour the world. 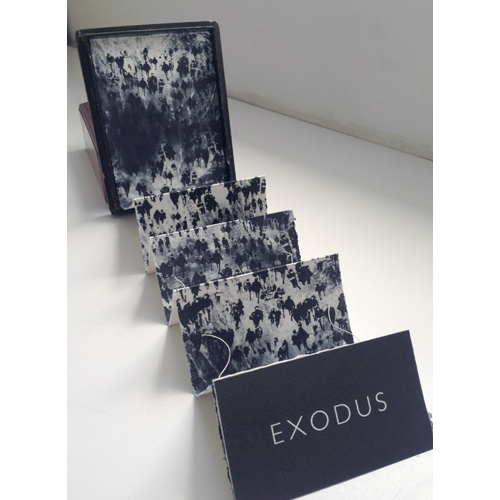 It is a unique artist book printed as photogravure with multiple plates on Hahnemühle 300g acid free paper using inks from established manufacturers such as Charbonell and Gutenberg. Paper size: 14 cm x 100 cm, box closed: 9.5 x 16.5 x 21 cm, the print is made as a leporello and sewn together with ivory linen thread, year of production 2016/2017.